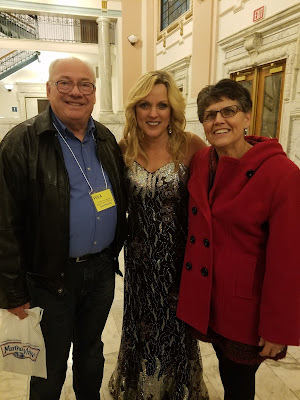 Rhonda Vincent after her recent performance at St. Clair Memorial Hall. Darke County Center for the Arts recognizes Don and Mary Jane Dietrich as Spotlight Sponsors of the recent sold out Artists Series performance of Rhonda Vincent & The Rage, Saturday, January 20th at St. Clair Memorial Hall. DCCA Executive Director Andrea Jordan stated, “DCCA counts itself very fortunate to have the support of individuals who recognize the value of the performing arts and who choose to give of their personal funds to help make the programs accessible and more affordable. Their donation provides the opportunity to experience the beauty of live performances in a jewel of our community, St. Clair Memorial Hall,” she concluded. Rightfully known as ‘Queen of Bluegrass,’ Rhonda Vincent and her award-winning voice reach beyond the boundaries of bluegrass to power a show that thrills lovers of music from any genre. Rhonda’s band, The Rage, consists of Aaron McDaris, who has been called the premier banjo player in the world of Bluegrass music. Other members of The Rage include fiddler Hunter Berry, who is not only a top-rated musician, but also Rhonda Vincent’s son-in-law, and dobro player Brent Burke, the first person to ever receive a B.A. in Bluegrass Music. Multi-instrumentalist Mickey Harris, a thirteen-year member of the band, also sings any and all vocal parts, a skill also possessed by Josh Williams who also plays almost every instrument well. Coppock-Hole Trust, The Bistro Off Broadway, Greenville National Bank, and Greenville VFW Post 7262, were also sponsors of the concert by Rhonda Vincent and the Rage. Additionally, the Ohio Arts Council helps fund this program with state tax dollars to encourage economic growth, educational excellence and cultural enrichment for all Ohioans. DCCA also receives operating support from the Harry D. and Esther Stephens Memorial as well as funding from the Ketrow Foundation and Lydia E. Schaurer Memorial Trust Fund. DCCA membership contributions also help support this show. The Toledo Symphony Orchestra returns Saturday, May 19th featuring Oh, What a Night! With Connor Bogart, for the final Artists Series performance of DCCA's 2017-2018 ARTS COUNT Season. Guest soloist, Connor Bogart will perform Broadway hits from Jersey Boys, Sweeny Todd, Phantom of the Opera, Les Misérables, and more. DCCA presents and promotes performing and fine arts encouraging cultural enrichment. For more information on DCCA the 2017-2018 ARTS COUNT Season contact the DCCA office at (937) 547-0908 or visit our website CenterForArts.net.